at this point in development it is obviously not so hard to write something about the upcoming API for Icinga 2 v2.4. We’ve been busy in the past months to design, refine and plan the development of such an API. In order to give you an insight into what’s going on and what else to expect, please lean back and grab a coffee or two. 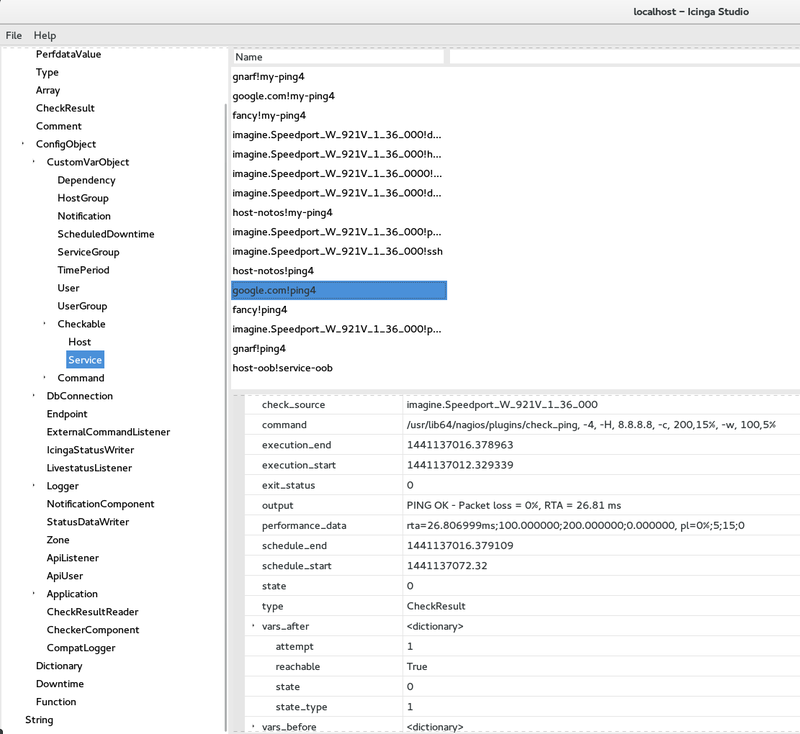 You might have seen it already and wondered why the cluster functionality contains the ApiListener configuration object including x509 connection handling. Generally speaking, the cluster API is an internal core interface, nothing we’d like to expose to users or programmatic scripts. We’ve also been discussing whether to use the existing JSON-RPC interface and expose that to users. While JSON-RPC is still cool, it would have been tremendously hard to add client libraries and examples. In the end it would be yet another proprietary API protocol, and we certainly want something easy but flexible for our Icinga 2 API. 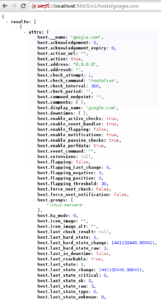 Looking at existing APIs and recommendations made by community members (thanks Michael Medin for believing in that) we decided to go for a REST API after some mockups and use-case analysis. In order to define our own url schema we’ve looked into other APIs such as DigitalOcean, Foreman, etc. and created concepts and to-dos for our very own schema. 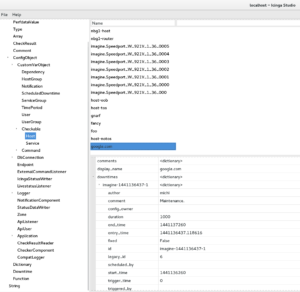 The main idea behind it is to allow external applications to create configuration packages and stages based on configuration files and directory trees. This replaces any additional SSH connection and whatnot to dump configuration files to Icinga 2 directly. In case you’re pushing a new configuration stage to a package, Icinga 2 will validate the configuration asynchronously and populate a status log which can be fetched in a separated request. If the configuration fails, the old active stage will remain active. If everything is successful, the new config stage is activated and live. Older stages will still be available in order to have some sort of revision system in place. List all config packages, their active stage and other stages. That way you may iterate of all of them programmatically for older revisions. 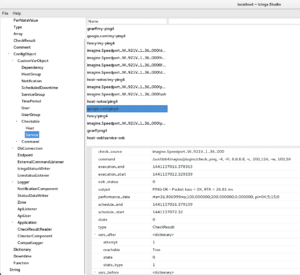 Apart from populating just the local configuration, the config file management interface also supports “zones.d” trees which will be taken into account for the well-known cluster config sync automatically. This API feature is mainly required for the upcoming Icinga Web 2 Config Tool for Icinga 2. Objects can be created by sending a PUT request including all required object attributes. Icinga 2 will validate all objects and return detailed errors on failure. Objects created by the API are persisted on disk. In the next development sprint we’ll also finish the cluster synchronization – new objects will automatically be synced amongst authorized cluster nodes, no manual configuration required. 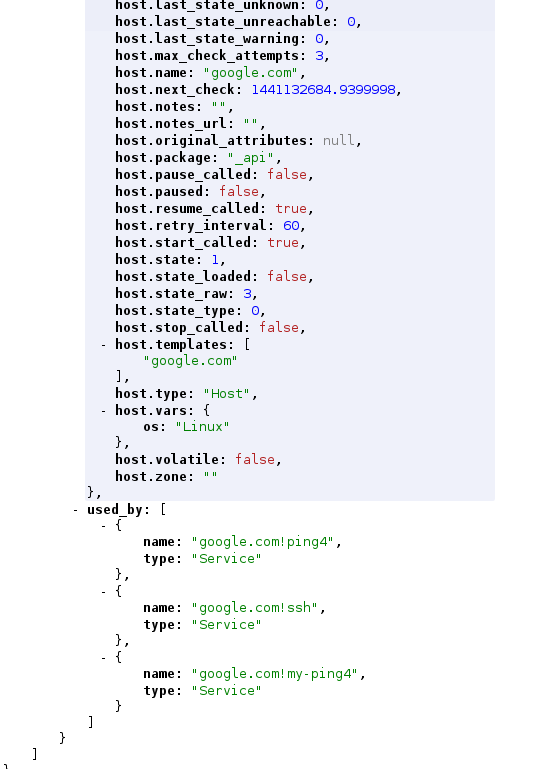 Example: Create host “google.com” with object attributes. The required “check_command” attribute is hidden in the imported “generic-host” template. Creating new objects will trigger apply-rule evaluation automatically – host.address and host.vars.os will result in “ping4” and “ssh” services. If the configuration validation fails, the new object will not be created and the response body contains a detailed error message. The following example omits the required check_command attribute. "Error: Validation failed for object 'google.com' of type 'Host'; Attribute 'check_command': Attribute must not be empty." In case you want to modify attributes at runtime, we’ve implemented a cool internal event handler system notifying external interfaces on changes (DB IDO, cluster, etc). You are not limited to specific attributes as known from Icinga 1.x, but (nearly) everything. Changing the host’s address at runtime is not an issue for example. All modified attributes are persisted on disk and will survive a restart. These modified attributes will result in objects versions (to be implemented) throughout the cluster synchronization. One thing to note – there’s also support for indexers, e.g. 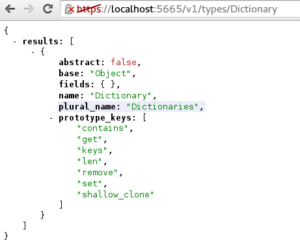 “vars.os” instead of declaring “vars” as JSON dictionary. In case of deleting objects, it’s a bit trickier: What happens if you delete the host object having several services depending on it? In the past, the host would have been deleted and the services would remain an inconsistent state. The solution to that sounds simple – track the object dependencies and only allow to delete such dependency chains if the user says so (cascading delete). If not, the DELETE request will return an error. You may also only delete objects created by the API – that’s for safety reasons preventing unwanted mixes of static configuration, config management and runtime config changes. 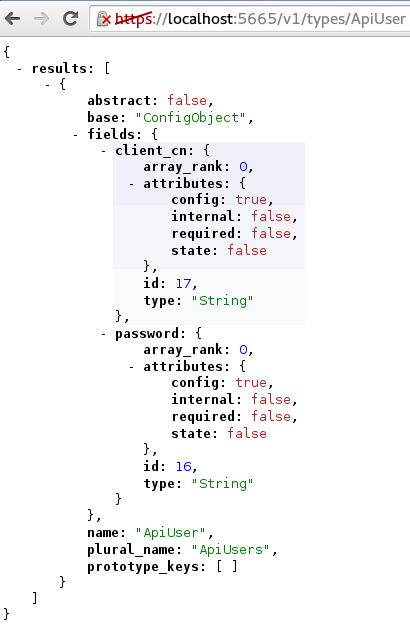 Note: Apply Rules must be statically configured or passed through the config management API. Newly created objects will automatically trigger apply rule evaluation (e.g. host with address automatically gets the “ping4” check assigned if that apply rule is in place). 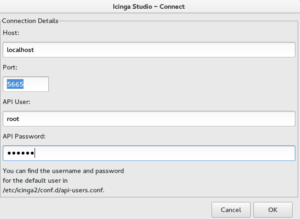 While Livestatus and DB IDO do not expose all object attributes, the Icinga 2 API allows you to fetch all object types and their runtime configuration and state attributes. Apart from accessing a single object you may also use the same filter expressions known from apply rules to fetch a filtered list of objects. You can select specific attributes by adding them as url parameters using ?attrs=…. Multiple attributes must be added one by one, e.g. ?attrs=host.address&attrs=host.name. Another cool thing – the check results also contain the executed command. That’s something pretty helpful for testing your configuration. Or – check the group membership of a host. Modify the attributes at runtime, and retrieve their status again. 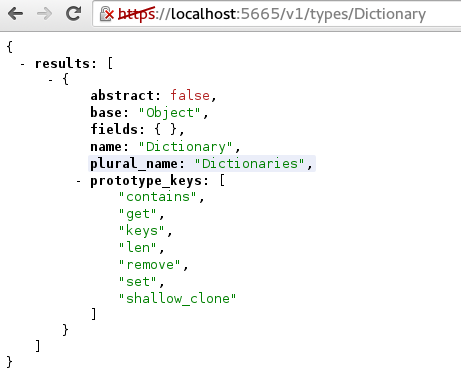 Hint: If you want to view JSON in your browser, look for apps like for Chrome: JsonView. Finishing this task is scheduled for the next weeks, some details are still missing. 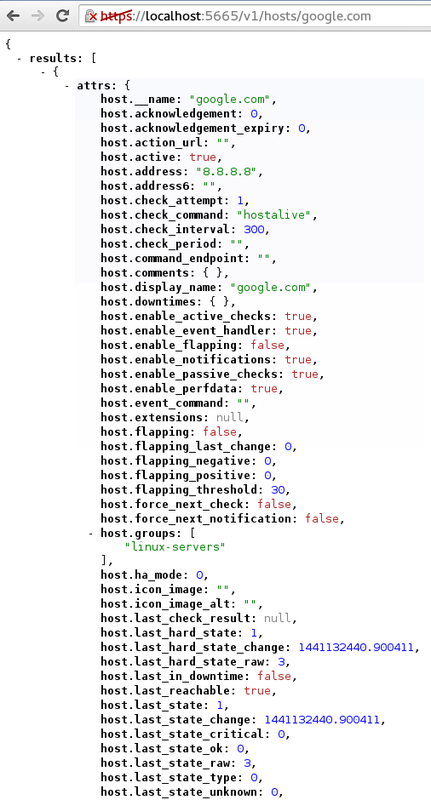 Actions provide well-known runtime commands where you’ll schedule downtimes, acknowledge problems, add comments, etc. By using the same filter expression as found in the config language, you’ll have lots of possibilities to trigger actions. Futhermore all passed attributes are easily identified by their name. 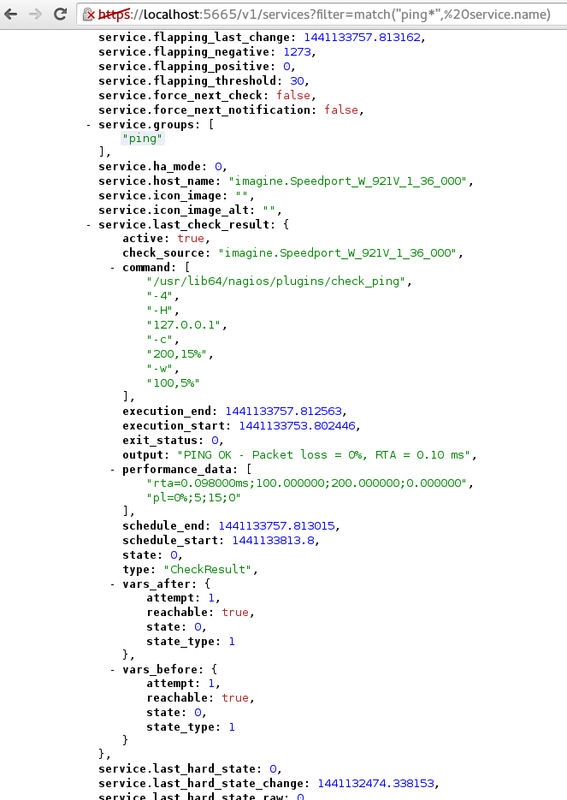 Forget about Icinga 1.x or Nagios using “SCHEDULE_HOST_DOWNTIME;host1;1110741500;1110748700;1;0;7200;foo;comment”! Example: Reschedule check for host “google.com” using a filter. "status": "Successfully rescheduled check for google.com." Example: Acknowledge all service problems at once. 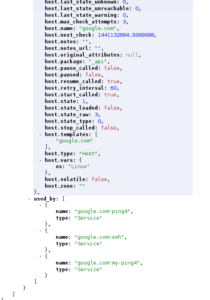 "status": "Successfully acknowledged problem for host-oob!service-oob"
"status": "Successfully acknowledged problem for google.com!ssh"
One more: Schedule a downtime for all hosts having the custom attribute “vars.os” set to “Linux”, e.g. for a general Puppet run rebooting the boxes on kernel updates. "status": "Successfully scheduled downtime with id 11 for object google.com." 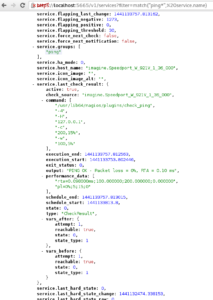 "status": "Successfully scheduled downtime with id 22 for object imagine.Speedport_W_921V_1_36_0009." Note: This is not implemented yet. Development sprint is scheduled for CW42. Btw – ohcp and oscp commands should be fairly replaceable by event stream clients forwarding all events to your umbrella monitoring system. Ok, there’s curl and alternatives on the shell. 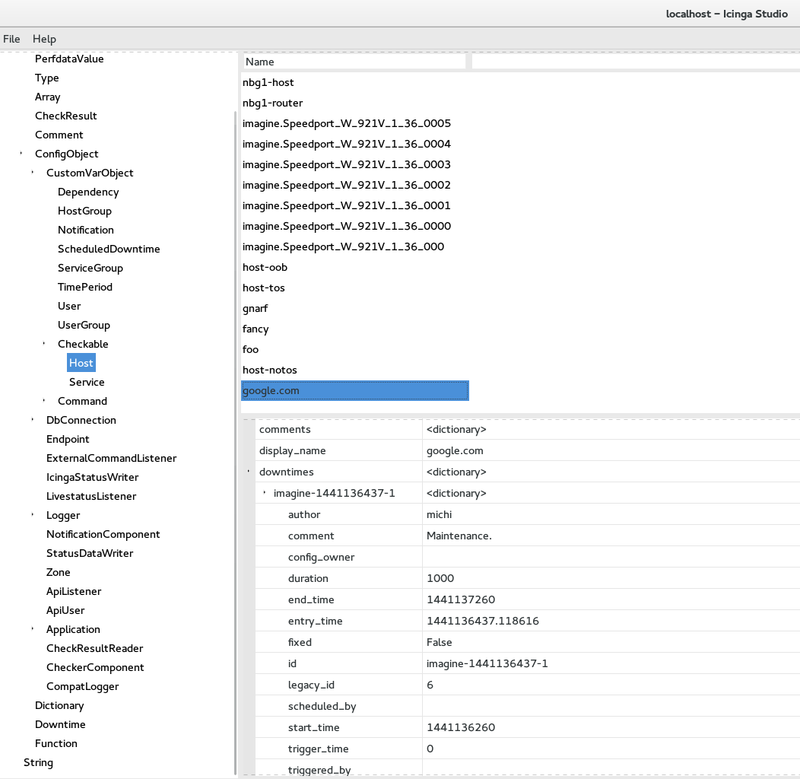 We’ll also work on the icinga2 console providing an HTTP client to directly connect to the Icinga 2 API. We’ve discussed, designed, re-evaluated and (pair) programmed quite a lot in the past weeks. Our goal is to have 2.4 ready right before OSMC later this year in November where you’ll get the whole package. Do we have an ETA on when 2.4 will be out?